Tonight was not going to be easy. With last minute fitness concerns and starting some players who hadn’t seen playing time in a while, it was going to be an uphill battle. Chievo were hungry, and wanting to atone for the 4-0 drubbing we’d given them back in November, so the odds were truly stacked against us, but for one brilliant strike, a bit of a Hail Mary, if you will. The game started with Paloschi looking dangerous, but not being able to fire a shot on target. In the 6th, he muscled Nesta off to try to create a chance, but to no avail. 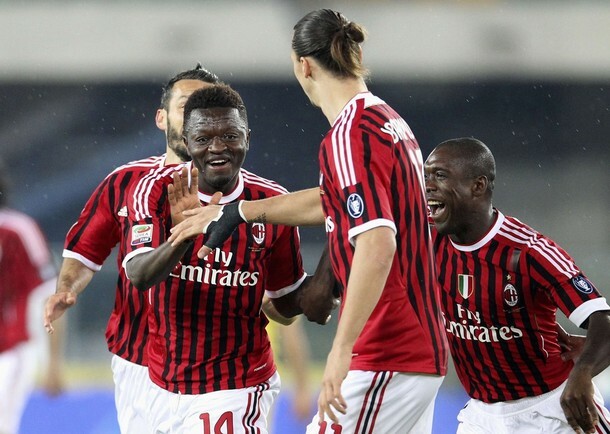 Muntari had a nice tackle in the 4th, which should have been an indication of his forthcoming hero status. Because in the 8th minute, completely out of nowhere, he sent a ball screaming in from well outside of the box for a goal that Sorrentino (or any other keeper) was never going to stop. 1-0 Milan. You know by now that there were no other goals. But that does not mean that there was no other drama. Between Pellissier and Paloschi, they Robinhoed™ shot after shot, 9 attempts by the end of the half, but only one on goal. In the 15th Pellissier outfoxed the young De Sciglio, filling in for Abate, by getting a foul called. But De Sciglio was just that much more determined and played an impressive game. I hope to see more of him. Anyway, Bradley skied the resulting free kick. He, too had a few attempts, but was also a Robinho disciple, apparently. In the 21st, Sammarco opened up the cautions with a yellow. Paloschi actually scored a goal, but it was disallowed for offside. In the 26th, Thereau had a decent shot that Abbiati tipped just wide. In the 30th, I had to laugh at Robinho doing a ridiculous number of unnecessary stepovers just to hold the ball. He might have needed some of that energy later. Like in the 37th when he worked his way into the area and had a great shot at goal, only for it to end up on the wrong side of the net. He's not complaining about the shoes, ref. 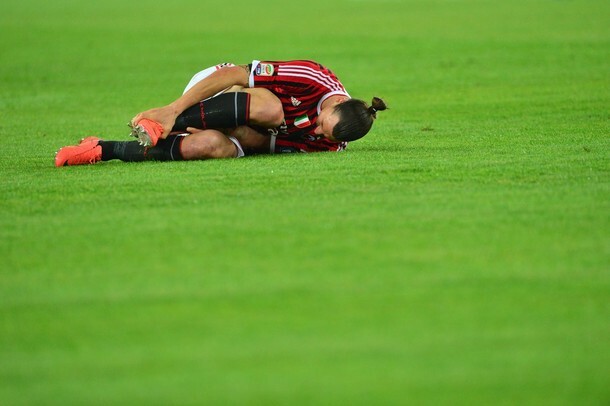 In the 38th, Chievo’s “Hack a Shaq” policy of fouling Ibra became more clear with a stomp on his foot by Dainelli. (Ironically, Rigoni also had a clumsy challenge on Robinho at the same time.) In the NBA, Shaquille O’Neill was this massive unstoppable force, but couldn’t make a free throw to save his life. So teams would just foul him to stop him, taking their chances that he wouldn’t score on the resulting free throws. Only in Serie A, the players know that maybe 1 ref in 10 is going to give a foul to our big man, which is a bit of a gamble considering that he can score on a resulting free kick if it’s anywhere near the area. Needless to say, it’s hard to say who took a bigger beating tonight, the also fairly big Pellissier or our own Ibrahimovic. Certainly, Pellissier got more of the calls, no question there. Abbiati had a big save on a Paloschi pass to Pellissier shot in the 42nd, but it brought concerns as to whether or not he would be able to finish the match because he appeared to have injured one of his toes. Being the tough guy that he is, though, and despite Amelia furiously warming up at the half, he made it through the match with flying colors. It remains to be seen if that costs us his appearance vs. Genoa, though. The half finished off with a yellow card for Dainelli on Nocerino in the 43rd followed by a last minute Thereau shot in stoppage time that went just wide. With so many injuries, I must say that the Milan fans played the 12th man position to perfection. They sang throughout the match, and often drowned out the Chievo supporters. When Nocerino made a nice play, they sang his song. They sang through the good and the bad, the pretty and the ugly, and they cheered and sang their club to victory. My man of the match? The 12th man. Thank you to all of the fans who travelled to Verona to buoy up our team in their time of need. Gattuso sees you and raises you two defenders. I love that guy. The second half saw Gattuso hitting the afterburner. It was so amazing to see him back to his old self, tackles followed by a handshake or embrace and a smile, and he seemed so excited to be out there, it was as if he’d even rolled back a few years, too. In the 50th, Pellissier had a shot saved by Abbiati, but also a nasty slide in on Yepes that was ignored by Mr. Valeri. After Pellissier skied another shot just a minute later, Milan decided to collect a couple of yellows for themselves. First Muntari in the 52nd for a tackle on Pellissier. He was lucky not to get a 2nd yellow for dissent, he argued so furiously with the ref. Then 5 minutes later, Zambrotta earned a card, too, for a late challenge also on the big Chievo front man. In the 61st, Gattuso made another nice run all the way to the touchline, where he was surrounded by 3 defenders and not given the corner. I mean, he deserved the corner just for heart. 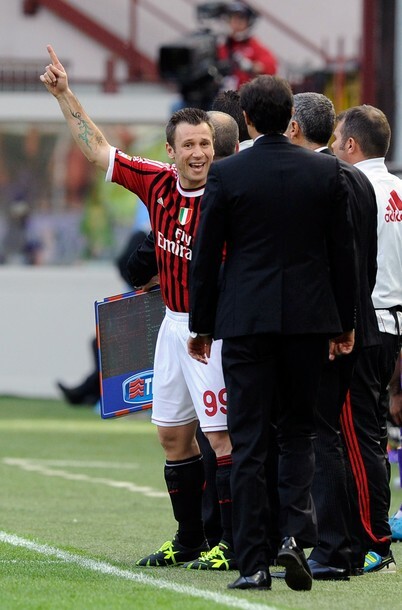 Allegri decided that this was enough for him, though, and subbed him off for El Shaarawy. Il Faraone was almost immediately taken down by Sardo, who earned a yellow for his efforts. Then in the 68th, we saw Urby Emanuelson come on for Robinho. Urby had been a last minute addition to the bench, as he was doubtful due to an ankle injury. Cassano: "Can't they add a 4th sub? I want to play!" In the 76th, Ibra had a great shot that curled just wide of the far post. In the 79th, Pellissier earned a yellow for dissent. I guess it’s good that Ibra knows better than to complain when he doesn’t get the calls. And in the 81st, perhaps the biggest scare of the night, Nesta handled the ball in the box. But Thereau had been spotted in an offside position by the linesman, so with the flag already up for offside, Chievo did not get the penalty awarded. That was a bullet dodged for sure, and Nesta, playing with a fever, had to be grateful for a linesman with good timing. In the 88th, Strasser, who had been injured since his recall from Lecce in January, took the pitch to replace Seedorf, who looked very spent, if not injured. Speaking of injury, it looks as if Yepes picked up a broken nose has he headed a ball clear and collided with Thereau on the clearance. Certainly, he was bleeding and had to receive treatment before he came back out on the pitch. And as if that weren’t bad enough, in the dying seconds of the game, Cruzado, who had replaced Paloschi, sent a ball through that hit the back of the net, but Acerbi was rightfully called offside and the goal disallowed. Two goals disallowed for Chievo and a penalty not given, you could say that Chievo were a bit unlucky. But in fact, Milan were simply lucky in that the referee made all of the right calls on these three big plays. It’s not as if we had every call go our way, but in a season riddled with really bad calls, Valeri got the big ones right tonight. And with 13 shots by the Flying Donkeys and only 2 goals, it is obvious they needed more than luck to pull off the win. But Milan made the best of fewer chances, with only 49% possession and 5 shots, 2 were on goal. Even our bench have mad skills, it seems. I have not been so grateful for a win all season. Not just for our Scudetto hopes or for the players who couldn’t play and help their team tonight. But for the hope and love of Milan, to show that when the going gets tough, and when injuries make it seem impossible, we can still pull off the win. Our boys left every ounce of strength they had out there tonight. I have never been so proud. And for Muntari, who is oft criticized for his inconsistency, poor passing, and hotheadedness, to net another big goal for Milan must have felt quite good. His goal was like a Hail Mary, even if it was near the beginning of the game, a goal that inspired hope and faith in every Milan player, whether in the infirmary, on the bench, or playing in the rain. Even with some scrappy play and relying on the mistakes of Chievo to create chances, our boys pulled it off. Bravo, Milan. Top of the table for 22 hours at least, but you’ll always be top of the table to me.